About the BookHumorous as well as serious storytelling-style book addressing happiness, what influences, impairs, and enhances it. Adverse experiences, attachment, relational processes, benefits of happiness and how-tos. About the AuthorElizabeth Power, M.Ed., is recovering from starting out in a big Unhappy Hole. She has climbed and clawed her way to Happy in recent years, and tends to hike up her Happy at every chance. She's an accomplished speaker and educator, with over thirty-thousand hours creating, delivering, and evaluating adult learning across a variety of contexts. From the National Center for PTSD to J.D. Power and Associates, and from Sidran Institute to the Children’s Institute, she has helped people learn, grow, and change. A graduate of the University of North Carolina School of the Arts, the University of North Carolina at Greensboro, and Vanderbilt University, she’s as funny as she is educated. She still speaks plainly, thinks clearly, and speaks well—enough of a storyteller to make the cover of Successful Meetings, and a veteran of the Montel Williams and Faith Daniels talk shows. She’s a funny writer with a strong voice who addresses tough issues writing in a variety of styles. This was a great book, filled with humor and down-to-earth thoughts that will help put a smile on your face and a spring in your step. It will help you to see that things are not as gloomy as one might first thing and it will encourage you to find happiness in everything around you no matter how large or how small. While the author looks at being happy through humor in many ways, she is really talking about life in general and is working to inspire all to change the way that they look at life and to work on moving all who read this, and all who hear her voice to take on the mantra and the lifestyle of living happy everyday. I know people who swell on the negative and for me I cannot live in that place. This book worked well with my own philosophy on life and thus I have to say that I would highly recommend this to anyone who is trying to be happier in their life altogether. I read this book too and loved it! It is so down to earth with fun things to do to bring yourself up out of the doldrums. 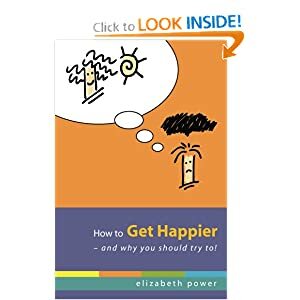 Elizabeth Power really understands happiness and presents her ideas in a very entertaining style.